Matthew Locke was born in 1621 or 1622, in Devon, and received his musical training at Exeter cathedral, where he was a chorister. Not much is known of his career during the Civil War. He was certainly in the Netherlands in 1648, when he copied a collection of Italian motets, and he had probably returned to England by 1651, when he composed his earliest collection of consort music, The Little Consort, for a friend in Exeter. He evidently spent most of the 1650s in London, where he wrote music for several of William Davenant’s dramatic entertainments, including The Siege of Rhodes of 1656, often thought of as the first English opera. In 1660, when Charles II was restored to the throne and the court was reassembled, Matthew Locke effectively assumed the position of England’s leading composer, for most of his senior colleagues, such as Henry Lawes, Nicholas Lanier and John Jenkins, were too old to take an active part in the court’s musical affairs. For the next quarter of a century Locke divided his time between writing music for the royal orchestra, the Twenty-four Violins, supervising chamber music in the private royal apartments, playing the organ in the Catholic chapel of Charles II’s Portuguese queen, Catherine of Braganza (Locke was himself a Catholic), and writing music for Davenant’s London theatre company. He died in the summer of 1677, and was commemorated in an eloquent elegy by his young friend and probable pupil, Henry Purcell. At first sight it is not easy to see why or how Locke wrote concerted Latin works such as Super flumina Babylonis and Audi, Domine, clamantes ad te. Latin motets were sung in Catherine of Braganza’s Catholic chapel by Italian singers, though there is no sign that violins were employed there, and most of Locke’s Latin works survive in sources connected with the Oxford university music school and Edward Lowe, its energetic professor. 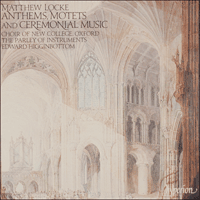 Locke wrote at least one of his Latin motets for the Oxford music school – Lowe wrote on one of the parts of Ad te levavi oculos meos that it was ‘made by Mr Matthew Locke to carry on the Meetinge at ye musick school. Thursday ye 16th Novem: 1665’ – and it may be that all of them were written for Lowe and his Oxford performers rather than for Catholic services at court. The composer seems to have been living in Oxford at the time in order to escape from the Great Plague, which was raging in London. Super flumina Babylonis, a setting of Psalm 136, opens with a two-section ‘simphonia’ – the Air and the Saraband of the D minor ‘Broken Consort’ transposed to the sombre key of C minor. Thereafter, the work is a kaleidoscopic patchwork of short sections, contrasting passages of recitative, dance-like triple time and ritornelli in a manner that harks back to the late church music of Monteverdi. Audi, Domine, clamantes ad te, a setting of an unidentified devotional text, has a similar design, though it opens with just a single-section allemande-like sinfonia, and is an even more remarkable marriage of sensuous Italianate textures and angular, surprising English harmonies. Responding to some repeated phrases in the text, Locke uses a triple-time passage as a kind of refrain. Jesu, auctor clementie, a setting of a hymn related to Jesu, dulcis memoria, uses the idiom of the Italian canzonetta, in which the verses are interspersed by a recurring string ritornello. The piece is awkward in places, and may date from the 1640s when Locke was coming to terms with the Italian style. Locke’s connection with Oxford and Edward Lowe was maintained over a long period, for in 1672/3 he was paid £5 for ‘composing the ode’ for the Encaenia or Act, the annual degree ceremony held in the Sheldonian Theatre; on that occasion, 5 July 1672, ‘Mr Lowe and the Musick’ were paid £319s4d for ‘their service at the Act’ and the Oxford writer Anthony Wood wrote ‘Encaenia; excellent musick’ in his diary. The work in question was almost certainly the ode Descende caelo cincta sororibus, which survives in a score in Edward Lowe’s hand and sets a quaint Latin text that is clearly intended for an academic occasion in the summer; the ‘Oxford Ode’ only developed as a discrete genre after the Sheldonian was opened in 1669. The music, too, suggests a date in the 1670s. The work opens with a two-section prelude that effectively forms a French-style overture, an idiom that Locke and other English composers only took up in the 1670s. And the rushing scales near the opening relate to the overture to his incidental music for The Tempest of 1674 as well as to Purcell’s early ‘Staircase Overture’. The second part of the overture (a saraband in two sections, each repeated with a variation), also returns repeatedly as a ritornello between the vocal sections, an unusual and effective device. As far as is known, this recorded performance is the first since 1672. It is also hard to see why Locke wrote so much Anglican church music, since he seems to have converted to Catholicism early in life, and never had any formal connection with the Chapel Royal. Nevertheless, he was apparently called upon to write for it in the 1660s when new repertory was needed after the hiatus of the Interregnum. This is certainly so in the case of the great polychoral anthem Be thou exalted, Lord, a setting of verses from Psalm 21, for it was performed in Whitehall Chapel on 14 August 1666 to celebrate Albemarle’s naval victory over the Dutch earlier that summer; Samuel Pepys, who was present, called it a ‘special good anthem’. The piece is designed to exploit the geography of the Chapel Royal. It opens and closes with a ‘grand chorus’ for all the performers – that is, two antiphonal vocal choirs in the decani and cantoris choir stalls on the floor of the chapel, a third vocal choir of soloists in a gallery above, and two instrumental groups: a consort of two violins, two bass viols and two theorbos in a gallery, and a string orchestra in the chapel below. Inspired perhaps by Louis Grabu, the follower of Lully who had recently arrived at court to train the Twenty-four Violins, Locke uses the French five-part orchestral scoring in this piece, with a single violin part, three viola lines and bass violins – tuned a tone below the modern cello. O be joyful in the Lord, a setting of Psalm 100, is a more conventional example of the sort of Restoration verse anthem familiar to us from the works of Blow and Purcell, with its four-part string writing with two violins, and its dance-like string passages. It was evidently written for the Chapel Royal soon after the Restoration, for its text appears in James Clifford’s The Divine Services and Anthems usually Sung in his Majesties Chappell of 1664. But once again the music survives only in an Oxford source, an autograph score with parts in the hand of Edward Lowe, which was presumably prepared for a performance at the university music school. How doth the city sit solitary, a setting of verses from the Lamentations of Jeremiah, is one of the finest examples of Locke’s marriage of the Italian and English styles. The organ part, which contributes not a little to the work’s rich dissonances, was written out in full by the composer, and is a valuable guide to his style of continuo playing; Roger North wrote that the Italian musicians in the queen’s Catholic chapel objected to ‘his manner of play’, and insisted that their singing be attended ‘by more polite hands’. Lord, let me know mine end became Locke’s most popular work after his lifetime, though it was usually performed in a version that ruined the remarkable effect of the end, conceived for solo voices and marked successively ‘soft’ and ‘softest of all’, by allocating it to the choir. In this recording we have tried to reproduce the effect of performances in Oxford and London under the direction of the composer. We chose the relatively dry acoustic of Rosslyn Hill Chapel in Hampstead because Whitehall chapel was only about 75' by 30', and the music school at Oxford was even smaller. Male voices are used throughout; women began to sing in English choirs only in the 1770s. The normal practice in the Chapel Royal and at Oxford was to use one-to-a-part strings, but we have used orchestras in Be thou exalted, Lord and Descende caelo cincta sororibus because they were written for special occasions; the score of the former specifies a ‘band of violins’, and the surviving performing material of Oxford academic odes have duplicate string parts. These Oxford parts also reveal that bass stringed instruments played with the violins, leaving the solo vocal sections just to continuo instruments. A variety of continuo instruments were used on occasion at Oxford, including theorbos and plucked keyboards in addition to the music school organ, a four-stop Dallam instrument.